I'm going to start another series/category, this time being reviews on old things. In these posts, I will look at old products, to find out 1) How good they really were in the past compared to other old alternatives, and 2) How good they are now compared to newer alternatives and whether they should continue to be used. I may also be looking at some stuff that are not that old, but the hype has in my opinion died down. Wink wink. Well you'll see it when I post it. Now lets move on to the meat of this post, starting with an old famous product. Audigy, one of the things that changed the sound card market. Creative first changed the sound card market with the launch of their Sound Blaster series, but with the rise of onboard integrated audio, people have no need to purchase an additional sound card just to hear sound. Creative needed to produce something better than the integrated stuff, something that can do what those cannot. Like newer EAX, Dolby Digital/DTS decoding, and 24/96 DAC. And then there are those things that sound cards have that onboard sound didn't: 5.1-channel analog output, SPDIF output, and better sound quality in general. The launch of X-Fi made Audigy obsolete, but the Audigy is still a sound card that is better than onboard sound. Or should it be "was"? Lets find out and solve the mystery. And with measurements. No "subjective comparisons", because I am willing to bet that the majority of the time, Audigy will win because it sounds different. (Thing is, it really does sound different, and that's not a good thing.) 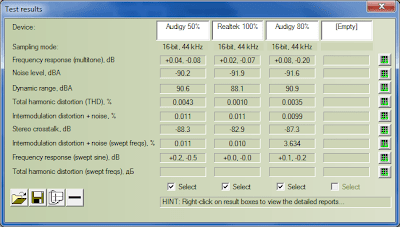 And even if no difference is heard, Audigy will win, because, well, it's a Sony sound card. But before we get to the comparison, I have to sort out something with Audigy first. You can find discoveries made by other people on the web, but to summarize, the Audigy is f***ed-up. Sampling rates other than 48kHz resulted in levels 0.7dB lower than 48kHz. Going 24-bit in software and 24-bit in Windows 7 OS settings resulted in higher harmonic distortions compared to 16/16, 24/16, or 16/24. Strange IMD test results were obtained with some combinations of volume and sampling rate. And 24/96 gave a really, really, really, really, really early high-frequency cutoff. I can't exactly tell if this thing has a real 24-bit mode, because while 24/96 gave better SNR/DNR compared to the rest, the performance is right at the limit for 16-bit. Someone more knowledgeable than me needs to shed light on this. I measured Audigy at 80% because at 100% it was higher than what Xonar STX could take in. Realtek was at 100%, but still Realtek's output level was lower than Audigy's (-4dB vs -3dB). 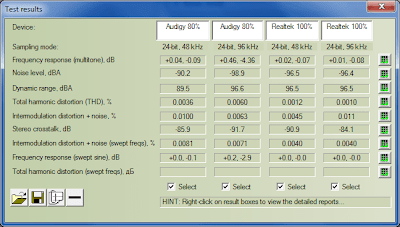 On thing I noticed during repeated testing (for protection against aliens causing strange results), is that the noise level of the Audigy fluctuates more greatly than I feel sound cards should. Expect a few dBs of inaccuracies. (1dB is 1.122 times, 2dB is 1.122 x 1.122 times and so on.) Noise level also affects THD and IMD numbers, though to a smaller extent. 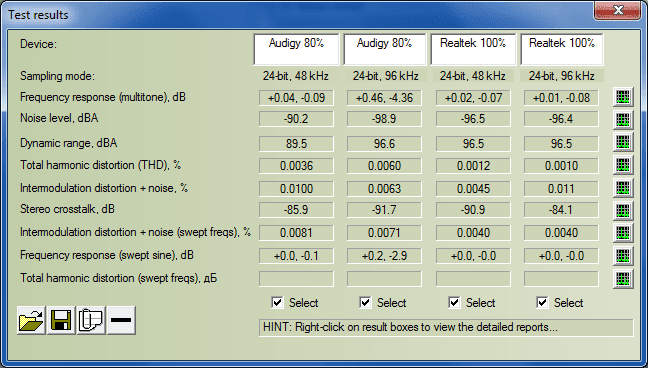 For this one I included a measurement of Audigy at 50%, because 80% resulted in huge IMD at higher frequencies. I included two measurements of Realtek @ 24/96 to show how much the noise and crosstalk can fluctuate. Audigy also exhibits the same behavior. To be fair, Audigy is a 2001 product, launched in the same year as Pentium 4. Well it takes a while before people start using it, so I'll compare it against my MSI 845 Pro4 which was bought in 2002. That had an ADI1885 codec, which is an AC'97 one so it is limited to 16/48. The component's manufacturer-rated DNR is -90dB, and THD at -85dB. Digital-to-analogue conversion, Audigy wins hands-down. And Audigy has surround out, digital out, 24/96 (at least on paper anyway), and hardware-accelerated EAX. And one thing that is important but left out on paper - at that time, due to high latencies and insufficient CPU power, music tends to freeze here and there when something is keeping the HDD or CPU busy, and that happened more often with onboard audio. The extra processing power of a sound card prevents that from happening. This still happens with USB sound cards and DACs in systems with high latencies, although almost nonexistent with onboard sound residing on the southbridge which is connected to the northbridge (now inside the CPU) via DMI. In short, sound cards were essential for good and reliable performance, especially if you're playing MIDI. Compared to Sound Blaster Live!, Audigy has a newer, more powerful processor, and better codecs. Well that's a given, for Creative released Audigy as an upgrade from SBLive!. 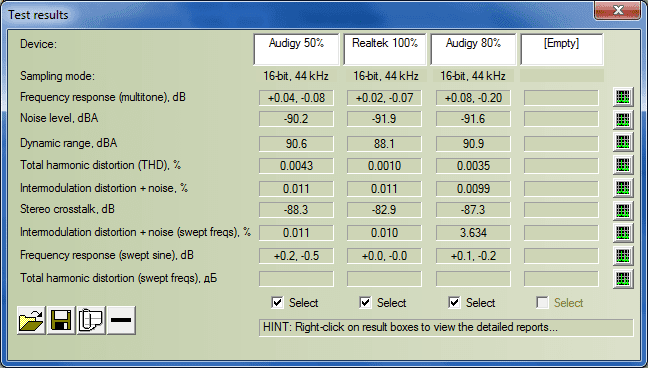 Somewhat unexpectedly, Audigy got badly thrashed by the Realtek ALC888 onboard sound of GA-MA770-US3. THD is worse, IMD is worse, both can fight each other in noise levels, which one having less noise depending on the sampling rate/bit depth and dependent on the instantaneous noise in the computer. The Realtek onboard achieving -100dB THD and -90dB THD+N is the unexpected part. Not just Audigy, this thing will thrash cheap USB DACs, beat some sound cards, and give some high-end sound cards/DACs a run for their money. However what the numbers don't say, is that high noise is often much more worse than high distortion, and that a lot of the noise of the Realtek come as multiple peaks in the audible frequency, which will be heard as a whine, most likely changing with the CPU and HDD doing their stuff. Though I say that, Audigy's noise spectrum is much worse, in both numbers and graph. One thing that can be learnt from this (and other measurements that I've done on other things), is that sound cards in the past really really sucked, and sound cards today are really really good. Digital audio and DAC technology have improved a lot since their early days. In the past 0.001% THD seemed like something that can only be attained by the best of the best DAC, and even paying a lot of money does not guarantee you such performance if the money is thrown somewhere else, e.g. wood enclosures and tubes. But today, quite a few product do 0.001% THD, some even doing half of that, and some doing 0.001% THD+N (still a feat IMO even today). Extra chapter - "But Audigy sounds better! Subjectively"
My experience tells me that, if a sonic difference can be reliably heard, the measured difference is usually very big. And indeed, Audigy's "uniqueness" is measurable, especially if you're using the wrong settings, and it's not mentioned in the manual or anywhere what are the wrong settings. 1) Audigy has CMSS enabled by default when you install the card onto your system. It will also revert to this default setting whenever it re-detects the card as a different piece of hardware (e.g. due to changing PCI slot). Disable it if your goal is accurate reproduction. Actually, disable it anyway, because I feel that SRS WOW sounds much better than CMSS. And SRS WOW comes free with WMP. 2) The latest version (at the point of this writing) of the kX driver for Audigy has the tone controls at reduced bass and treble when I installed it. Coincidentally, when I was using Audigy a long time ago with a slightly different audio setup, I preferred the sound with bass and treble both at 40% (midpoint is 50%). But that is because my setup had overpowering bass and treble. And the kX driver's settings are even lower. These two settings definitely result in audible changes that can make the Audigy sound better with certain setups. No doubt it will sound different at least. But as for people who claim that Audigy (and X-Fi too, with CMSS and Crystalizer) and kX driver sounds better because of "more accurate reproduction", lol. I'm neutral when it comes to post-processing in audio, because the speakers and room are inaccurate as @ss in the first place, and if you can use post-processing to make the final result closer to ideal, why not. P.S. bit-perfectness is f***ed the moment the data reaches the DAC. Or the digital filter which some people seem to like and pay lots of money for. So if you like the sound from your Audigy, continue using it. But a good source must be able to reproduce accurately when the situation calls for it, like with an accurate audio system. And that is where the Audigy fails. Then again, this only makes Audigy fall into the same league as other products using using technology that is at least 10-year-old, and there is always a big market for that. The Audigy series is hardwired to resample to 48khz internally so its at least part of the reason for your strange testing results. Did you perform a loopback test for the Audigy and Realtek? Or did you use a highend card for the line-in? Is the noise or distortion from rmaa stats more significant in the real world? What would be a very good level of distortion (IMD/THD)?